Drones are the future, also in EMS and medical fields. But the application of these new devices is not easy. However, Denmark will see the intervention of these special drones to deliver blood and medical instruments. Falck will be a supporter of this project! 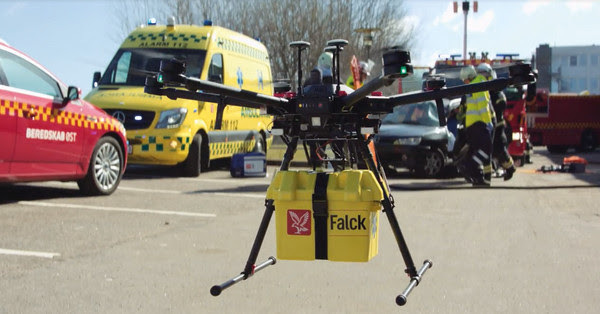 For three years, blood samples and medical equipment will be flown with drones between Odense, Svendborg and Ærø in a new project launched by researches, Falck and Autonomous Mobility. Later, drones will also transport highly specialized healthcare professionals who need to arrive quickly. This will ensure better treatment and save the Danish health care system almost DKK 200 million a year. Falck sees great potential in the use of drones. Falck CEO Jakob Riis believes that initiatives like HealthDrone are important elements in creating a future-proof healthcare system. “As an active partner in the Danish healthcare system, we are deeply concerned with developing the Danish health system together with the research and the hospital system and jointly finding solutions that both make us more effective and which benefit the patients. Therefore, it is obvious for us to participate in this ambitious project, where we can get the first valuable experience with health drones”, says Jakob Riis. Drones are to be the hospitals’ extended pipe post system, explains researcher Kjeld Jensen from SDU UAS Center. He will be in charge when the project HealthDrone, with a grant of DKK 14 million from the Innovation Fund and a total budget of more than DKK 30 million, is to integrate drones in the Danish health care system. “We see health drones as an untapped potential for helping a strained health service with fewer beds for ever more elderly people. At the same time, patients must travel ever longer to get under treatment. The smaller hospitals are shutting down and the number of medical centers is declining – here, health drones can help”, says Kjeld Jensen. The initial tests of the health drones will be carried out in the airspace above Denmark’s national drone test center, UAS Denmark, at HCA Airport near Odense. The drones will then be tested in flights with blood samples from Svendborg and Ærø to the laboratory at Odense University Hospital. Today, the transport time is an average of 12 hours, but the researchers expect that the trip will take three-quarters of an hour by drone. “When we’re talking infections, time is crucial, and when the blood samples arrive faster, we can ensure better treatment and we can reduce the use of broad-spectrum antibiotics. At the same time, calculations show that if the drones take over the tasks that are laid out in the project, OUH will save DKK 15 million a year”, says medical director at Odense University Hospital, Peder Jest, who originally came up with the idea of drones in the health sector. OUH accounts for 7.5 per cent of the total hospital sector in Denmark, and if the drones were rolled out to all of Denmark, the estimated savings are approx.. 200 DKK million per year. At the same time, the researchers expect that there will be major savings on the climate account because the drones don’t use gasoline or diesel. Arab Health 2019: Experience Zone, Training and Workshops. what’s up at the Show?